Gorilla Manor wasn’t the exploding force I think Local Natives might have hoped for. Perhaps we were more gun-shy in 2009 than we are now. In 2013 the public is willing to thrust indie bands with catchy tunes into the spotlight with only one hit single and an EP to their names. In many ways we, the public, are okay sacrificing their creative integrity to force more catchy hit-singles out of them. We saw this briefly with two other 2009 released albums, Up From Below by Edward Sharpe and the Magnetic Zeros and from Sigh No More, Mumford and Sons debut LP. And we’ve seen the flip-side of that coin now. Edward Sharpe attempted to make an album that instilled some kind of new direction, and Mumford and Sons became a part of a cooperate machine that forced them to release an album identical to the first in nearly every way. Both of their follow-up albums sucked, probably due to the pressure associated with being in the public eye. 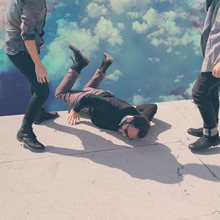 So it’s nice that Local Natives never broke out of the indie bubble, as it were. Upon its release, it flew mostly under the radar but in the 4 years of absence between Gorilla Manor and their new LP Hummingbird, we’ve seen absence make the heart grow fonder… and bigger. Gorilla Manor feels like a cult-indie hit in some ways, with a group of unlikely and loyal supporters who are late adopters rallying behind a band that’s been around for four years and popular for about one. And good for them. That debut LP was musically rigid but it worked. They didn’t need to lose control at all to make the music emotionally intense. Minus parts of “Shape Shifter” and “Sun Hands”, the band rarely let go of the wheel. But here in the opening moments of the new album Hummingbird, we have a band re-born and re-invented, never treading into imperfection but also more willing to loosen the musical reigns and fall into an authorial middle ground where not everything is so necessarily tight. It’s this realization, that tight composition isn’t a necessity, which makes the albums opener “You and I” the best track on the album. It’s a perfect fresh beginning. It still plays to the bands biggest strength, Taylor Rice’s incredible pipes, but it isn’t afraid to let loose and have more musical tracks going at one time. And that’s kind of a theme here. All the songs are slightly less precise than Gorilla Manor. Just listen to the opening of “Heavy Feet”, which immediately has more aesthetically changing patterns in 45 seconds than most of Gorilla Manor did in whole. Hand claps, pianos, multiple guitars, layered vocals, light bass and cluttered percussion make “Heavy Feet” and the first single “Breakers” refreshingly scattered. For at least 5-6 songs, Hummingbird does exactly what a sophomore LP is demanded to do: Giving us more of the same, but not. But it’s about by track number 6, “Three Months”, that Hummingbird loses me a bit. Too often on the back half does the album fall out of its love with chaotic builds and rousing choruses, which itself is okay, but they never find anything to replace those dynamic features with. “Columbia” is a snoozer up until the final 20 seconds, the aforementioned “Three Months” never musically excites, and minus the kind of fascinating Bon Iver guitar part of “Black Balloon”, that song doesn’t finally hit an interesting boiling point until the final 30 seconds. While it worked on Gorilla Manor in songs like “Sun Hands” and “Shape Shifter”, waiting until the end to give satisfying builds and drops is significantly less exciting if the chaotic descent is present in the entirety of the album instead of isolated incidents. “Black Balloon” is an okay song, and the ending is ultimately somewhat interesting to hear, but the whole song (and for that matter, the whole album) thrives on commotion and disarray and the drop does nothing to perpetuate that other than increase the volume levels. Now this isn’t the entirety of the back half. One of the albums best tracks, “Mt. Washington”, a slow crooning heartbreaker that correctly demonstrates how Hummingbird SHOULD operate musically (with less builds and drops and more consistently satisfying patterns and vocal runs) comes at the very end. And “Bowery”, the album’s final track, regresses back to the structure of Gorilla Manor, giving us multiple sectioned parts and building to a decently crescendoed finale, even if lyrically it’s not the bands best.